Celemony’s flagship Melodyne audio editor has long been reaching past the limits of what most people imagine as pitch correction. It was clear the mission of the software was no less than seamlessly transforming audio – shaping sound as directly as you can MIDI notes. Well, now it’s gone even further. Now we’re not just talking about moving polyphonic notes around. 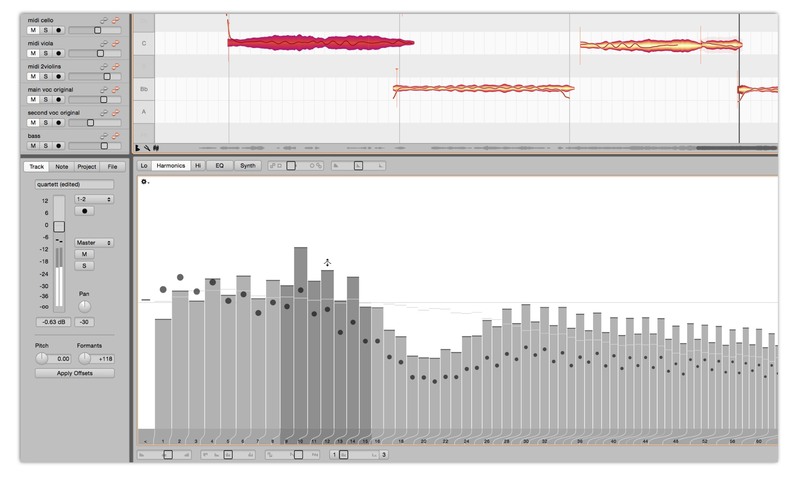 In Melodyne 4, we’re talking reaching into the spectra of polyphonic sound material itself. It’s like playing God with a recording. You’ll notice a shift in the marketing, too. Melodyne are now talking explicitly about “sound design” – not editing or correction, but transforming sound. That to me was always the most interesting potential to this software, so it’s nice to see it become the main message. With something this insane, you know mad mathematical genius Peter Neubäcker has to be involved. He’s the sort of character who thinks about these sorts of problems before breakfast the way the rest of us mortals ponder which color t-shirt to wear. No more track limits. Direct Note Access, Melodyne’s spooky ability to edit audio as easily as MIDI, now works across multiple tracks – even seeing and editing them onscreen at once. Dynamic tempo detection. Click now follows the flow of musicians, rather than having to impose a grid. You can also copy-paste tempo and the like. Hmmm… imagine if all software worked this way? Software has often promised to do something like this before, but the algorithm here seems to be way ahead of other attempts. Dynamic just intonation. Okay, actually, I haven’t learned yet what this is, but the early music nerd in me likes the sound of it. Question: how would you want a product like this reviewed? My own bias is toward experimental use of the software rather than proper editing workflows, but maybe that’s just me. And I’m sure I could talk to users who go other directions. And would you perhaps like Peter to talk about the way he sees the universe? Let us know in comments. We’ll be meeting up with Celemony next week, too. See you there. I know how German residents need some sunshine.